At the APEC CEO summit in September, Russia will push its initiative for greater transportation integration among Far Eastern nations. 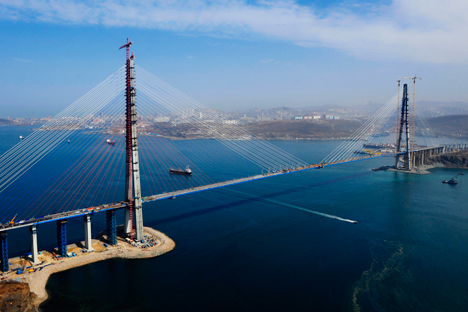 At the upcoming APEC CEO Summit, to be held this September in Vladivostok, Russia will unveil its plans to further integrate its transportation systems into Asia. Highlights include plans to modernize the Tran-Siberian Railway and the Northern Sea Route as well as to develop new routes between Asia and Europe and inter-regionally within Asia. Global trade forecasts show that trade within the Asian region will grow faster than trade between Asia and either the EU or the Americas due to intensive regional integration. Asia is the world’s leader in terms of simplifying interregional customs procedures and cutting the costs of doing business. While Russia was preoccupied with accession to the WTO, many APEC countries opted for regional free-trade agreements. Since the mid-1990s, more than 70 free-trade zone agreements have been concluded in Asia. Mikhail Kholosha, head of the transport development department of the Far Eastern Marine Research, Design and Technology Institute explained the potential for expanding existing Russian transportation infrastructure in the region: “Speaking about the Far East, the best place to start is in the south of the Primorye Territory. Japan, South Korea and China periodically test the possibilities of freight carriage via the Trans-Siberian Railway and in regional directions, such as the Multi-Modal Transport Corridors Primorye-1 and Primorye-2. These three corridors form a common, mutually complementary transport space,” Kholosha said. Several years ago, the Greater Tumen Initiative, acting under the auspice of the United Nations Development Program, conducted a survey of experts, government officials and businessmen in Northeast Asia on the possibilities of cargo flowing between them and China’s Jilin Province. A rough estimate of the amount of freight passing through this region in 2030 is 90–100 million metric tons. This means that the seaport in Troitsa Harbour in Russia’s Primorye Territory should be developed. It could become the biggest port not only in Russia, but in all of Northeast Asia. This cargo transit route alone could earn Russia billions of dollars a year, and there are several such growth points in the region. Last year, the first batch of containers arrived at the Troitsa Harbor marine port by truck from the Chinese city of Hunchun, near the Russian border. From Troitsa Harbor, they were dispatched to Japan on board a container ship. The Chinese province of Jilin, which borders Primorye, had been working towards that possibility for almost 10 years. Now, it takes two days to deliver cargo from Northeastern China to Japan, and there are plans to use the new transportation line not only for transit carriage between China and Japan, but also to carry freight from those countries to Europe via the Trans-Siberian Railway. However, to optimise the project, it is necessary to increase the capacity of the border crossing at the Russian town of Kraskino. So far, it processes 30 vehicles a day, but there is a demand for 200 vehicles with containers. The construction of a modern border crossing point at Kraskino is slated for completion in the fall, but increasing capacity alone will not solve all the problems at the crossing. Customs procedures still need to be simplified and the port capacity at Troitsa Harbor expanded. The idea of improving combined land and sea cargo shipments between Russia, China and Japan was recently backed by all the members of a consultative meeting within the framework of the Greater Tumen Initiative, held in Harbin in February. Unfortunately, Russia is still lagging behind and the pilot projects are being implemented between China and the Republic of Korea and between China and Japan, despite the fact that this partnership was initiated by China in 2008 as part of a drive to improve cooperation between China’s northeastern provinces and the Russian Far East. Experts are hopeful that Russia’s presentation at the APEC CEO Summit will mean that the country is ready to move forward on greater logistics integration in the Far East.